Deliciously Savvy received product in exchange for an honest and unbiased review and all opinions are 100% my own. Regardless, I only review products that I am truly interested in for myself and my family and of course for sharing those reviews with my savvy readers. Thanks for stopping by and have an amazing day! Since fabulous little Scarlet came into our lives I have been truly blessed as she is such a fabulous little human being that has changed my life. I am a mom of 3 and they are grown but I am now a proud God Mother to my little niece Scarlet and I just love her. I spend lots of time with her and I try to give her as much as I can to keep her dressed stylishly and to provide her with fabulous toys, books and more. That is why I am so excited to share Mia’s Moccs with you all as I just love their baby and toddler shoes. They are so beautifully made and they are fabulously priced for the quality. 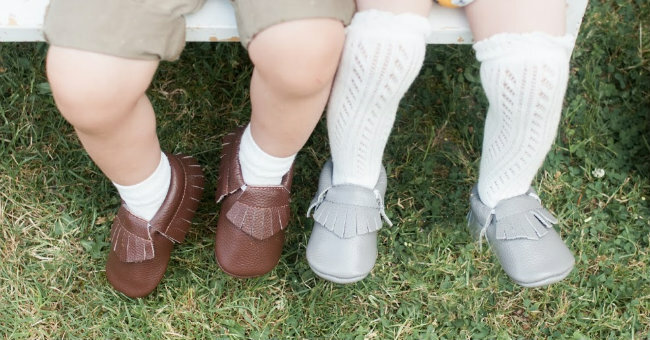 Kim and Alyssia are a mom duo from Canada that wanted to provide great quality moccasins at affordable prices for new moms, moms with large families, low income families, families with special needs children and military families! I think that is so special and I have to tell you… they are doing it right because these are the cutest moccasins I have even seen! I fell in love with a line of moccasins from Mia’s Moccs called The Magic Collection as little Scarlet loves Minnie Mouse and I knew that these would be the perfect shoe for her. 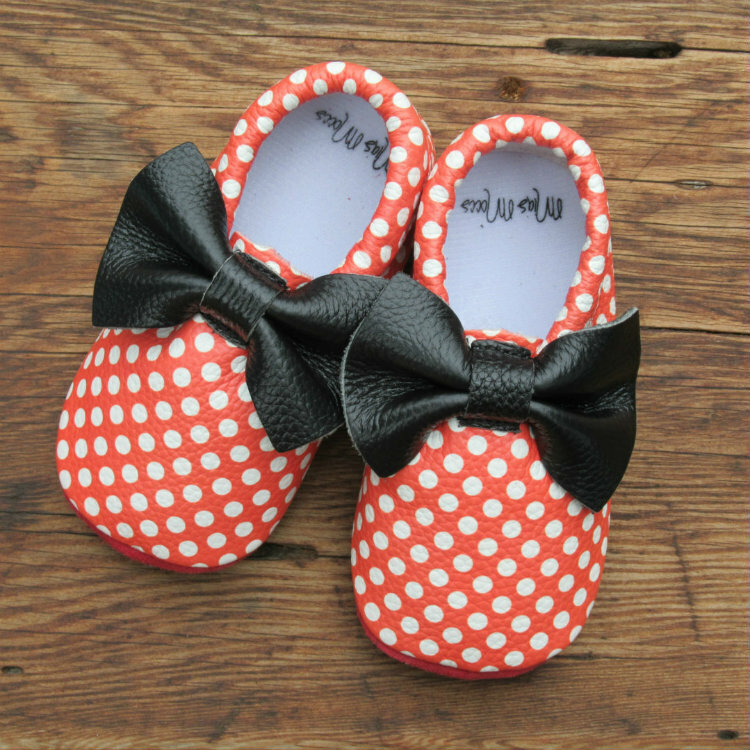 I chose the Minnie Bow Rubber Bottom Leather Moccasins as Scarlet loves Minnie Mouse and I knew that these would be the perfect fit for many of her outfits. I love that not only are these gorgeous moccs stylish but that they also provide the support and protection that your little one needs for her feet when walking. This style provides a rubber sole bottom which is durable for walking on even the roughest of terrains plus they are super soft and comfortable as they have an extra cushy insole that provides support and protection for your little ones foot. As you can see in the photo above, Mia’s Moccs has different styles available in The Magic Collection so that there is the perfect style for both boys and girls and each style comes with or without the rubber bottoms. Are they not the cutest things you have ever seen? I just love them and Mia’s Moccs carries so many more colors and styles of traditional moccasins as well so make sure you visit them and check them out online. These are gorgeously made with 100% genuine cow leather, designed in Canada all while being lovingly and ethically made in Asia. Stop By And Visit Mia’s Moccs Online And Visit Them On Social Media As Well! These Are Fabulous Gifts For The Holidays, Baby Showers, Birthdays & More! They really are super cute. I thought ‘hey, those look like Minnie Mouse’s shoes’ even before I read your review, lol. Little girls would love that. These baby moccasins are so cute! My favorite are the ones with the bows. 🙂 It definitely gives me baby fever when I see cute things like this. They will make great baby shower gifts though! Thank you for sharing. I love the premise for this company. It’s gratifying to learn of companies that give back or help others.